The SACIDS Africa Centre of Excellence for Infectious Diseases (SACIDS ACE) has organized a three days workshop on “Leading Transformative Change in Higher Education” for senior University management and leaders of research policy, research institutes and the Africa Centres of Excellence (ACE II). This workshop brings together the Director General of the Commission for Science and Technology (COSTECH), Director General of the National Institute for Medical research (NIMR), and Vice Chancellors of Sokoine University of Agriculture (SUA), Muhimbili University of Health and Allied Sciences (MUHAS), University of Dar es Salaam (UDSM), Nelson Mandela African Institution of Science and Technology (NM-AIST), Mzumbe University (MU), Catholic University of Health and Allied Sciences (CUHAS), The Open University of Tanzania (OUT), The Hubert Kairuki Memorial University (HKMU), Mbeya University of Science and Technology (MUST), Saint Francis University College of Health and Allied Sciences (SFUCHAS), Mwalimu Julius K. Nyerere University of Agriculture and Technology (MJNUAT) and Moshi Co-operative University (MoCU). In addition, the workshop is attended by the centre leadership of the four Africa Centres of Excellence in Tanzania; SACIDS Africa Centre of Excellence for Infectious Diseases of Humans and Animals in Southern and Eastern Africa (SACIDS ACE) at SUA, Africa Centre of Excellence for Innovative Rodent Pest Management and Biosensor Technology Development (RatTech) at SUA, Centre for Research, Agricultural Advancement, Teaching Excellence and Sustainability in Food Security (CREATES) at NM-AIST and Centre of Water Infrastructure and Sustainable Energy Futures (WISE Futures) at NM-AIST. This workshop was officially opened by Professor Sylvia Temu, the Director of Higher Education at the Ministry of Education, Science and Technology; and Chair of the National Steering Committee of Tanzania Africa Centres of Excellence. SACIDS has previously organized several training programmes for Leadership and Management since 2014 in collaboration Dr Tom Kennie of Ranmore Consult of the UK. This time, the workshop targets senior leaders in order to transform their leadership skills that encourage diversity, innovation and building the Universities that we want. Universities that meet the demands, take up the challenges and explore opportunities of the 21st century and the fourth digital revolution. This workshop comes in light of our understanding that SACIDS and the 3 other Africa Centres of Excellence in Tanzania are expected to be a catalyst for transformative change to propel our universities, in collaboration with our partner national research institutions, towards becoming centres of research excellence in Africa. SACIDS ACE has developed a framework for Research Leadership and Management at different levels designed for PhD students; Postdocs and PhD supervisors; and Community of Practice theme programme leaders and Departmental Heads. 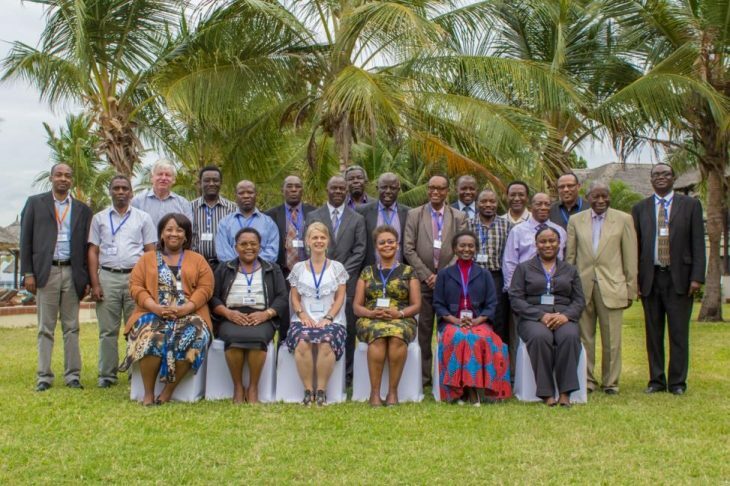 A group photo of senior University management and leaders of research policy, research institutes and the Africa Centres of Excellence who attended the Leading Transformative Change in Higher Education Workshop in Dar es Salaam held betwen 23 and 25 October 2017. Photo credits: Mpoli Pictures. Dr. Tom Kennie of Ranmore Consult delivering a lecture on leading transformative academic and reseach change and innovation. Photo credits: Mpoli Pictures. Professor Mark Rweyemamu, the Executive Director of SACIDS speaking at the Leading Transformative Change in Higher Education workshop. Seated from left; Professor Peter Gillah, the Deputy Vice Chancellor (Academic) of Sokoine University of Agriculture; Professor Sylvia Temu, the Director of Higher Education, Ministry of Education, Science and Technology; and Professor Andrea pembe, the Acting Deputy Vice Chancellor (Academic, Research and Consultancy). Photo credits: Mpoli Pictures. Mr. Mpoki Mwabukusi showing the new version of AfyaData, a mobile application for one health disease surveillance, to Professor Mark Rweyemamu, Professor Paul Gwakisa and Dr. Filomena Namuba.